Cheon Hwa Gung, Las Vegas on 2.2 by the H.C.
Mrs. McDevitt read Father's speech from Sermons of the Rev. Moon #43, titled "Hardship and Victory." "큰 연아! ([Big Yeon Ah] Elder Yeon Ah Choi, Hyo Jin Nim's wife, who is older than 작은 연아, [Little Yeon Ah] Younger Yeon Ah Lee who is Hyung Jin Nim's wife), Where can you solve what you have grappled with until you participated here? It would be impossible to reach your goal unless you make a leap forward holding yourself, who is heading for the future. Talk about the people in Las Vegas and its environment bearing in mind an assignment of 'Where do I go to be settled? ', and frankly share what you feel and understand." "I visited here to greet (True) Parents and I am happy that they are healthy. When Father goes back to Korea, Father will talk to all the Korean people, and Mother will go to Japan, and so I have been anxious about how they have been here. Talking about Las Vegas, I think it was Young Jin Nim that initially related to this place as a member of True Family. I think it was in 1999 when he was in Reno and he couldn't help but be sacrificed for the providential reason. True Parents couldn't reveal but just carried everything at that time, and after 2008 when Hyo Jin Nim passed away, they officially began to lead the providence here. I didn't come here often where True Parents visited many times to educate and lead you. Every time I see True Parents, I am sorry that I am not enough and don't know deeply what they intend to do. I, like all of you, have been worried about their health especially when I see them sacrifice themselves working day and night. Also Father sits for so many hours to talk and offers Jeong Seong in a manner we don't understand. I wished many times that they took more rest so that they can live long with us. When I see Father closing his eyes and sitting and ask him to go to his room to take a rest, he always says 'No.' In the beginning, I felt so worried and also wondered a lot why he, as 하나님의 실체 [God incarnate], had to live that way. What I gradually learned and felt through my brief experiences is that Father offers Jeong Seong at a level we don't know so that he won't leave even one crack in the providence. I think we tend to see and judge them, thinking 'Why didn't they do it this way or that way?' from our viewpoint who are not enough and don't know the reality of the spirit world. In that sense, All I can say is that as a child of True Parents I am so sorry that we couldn't go along with them in heart and always bring results. Every time Father needed to proclaim important messages, he came to Las Vegas, and I think we are in the process of understanding little by little our True Parents, who must put in order the spirit and physical worlds. Though we have a long way to go, I am truly grateful with my life in which I can have True Parents as 하나님의 실체 [God incarnate] who are united with God and have shown us the way to go. I have gradually understood that True Parents are the model and the standard for us to follow. Personally, I am sorry that I am undutiful (불효하다) to True Parents and I can't raise my head in front of them, especially because Hyo Jin Nim suddenly went to the spirit world in 2008 and I still should have been with him. In fact, it is difficult for me to come in front of True Parents, and every time they see me, they are worried about how I am. This time I felt again that we must live for God's will with a bright spirit and full of hope. Every time when I need something, Father gives me his words that encourages and gives hope to me. I think Hyo Jin Nim has a character that is necessary to liberate hell as quickly as possible. I am thankful that True Parents gave him their blessing so that he can work in advance in the spirit world, which in fact was a consolation for me who couldn't fulfill the responsibility. 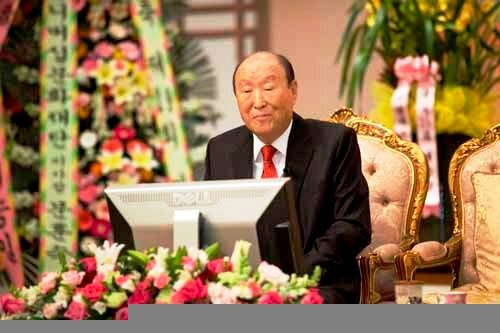 I truly thank True Parents again that they led, raised and blessed Hyo Jin Nim to the position where he, as a son, can contribute to True Parents in the spirit world. We have one year to go before D-Day. I felt again this time that we truly need to offer our utmost Jeong Seong to understand more of True Parents' mind and heart and also need to work hard. Thinking of Father's age, he shouldn't live like this. But since we aren't enough yet, Father always educates us and covers our failures, and the problem is that we don't know that fact and just think, 'That's' his job.' Every time I think of it, I feel so sorry. Because of the big sins that the ancestors of the 최 [Choi] tribe committed, I am personally in a position of not being able to come to True Parents. Nevertheless, True Parents embraced it with love and called me to the True Family. Despite the fact that I am so lacking, Father continues to encourage and trust me instead of scolding me, and I believe in the future I will be able to feel more the heart and love of True Parents. This year, I must make more efforts so that I can return joy to True Parents who have been through hardship because of us. Thank you True Parents."